Successfully Added Mini Bluetooth Speaker - 80dB, Bluetooth 4.2, 5W Speaker, 400mAh Battery, Compact And Portable Design to your Shopping Cart. This mini Bluetooth speaker features an extremely small patented design. Measuring just a couple centimeters in diameter, this Bluetooth speaker can be easily carried around inside of your pocket. Wherever you go, you’ll always be able to carry along your favorite tracks. Whether you’re at home, the park, or at the beach – from now on you can listen to music at any time. 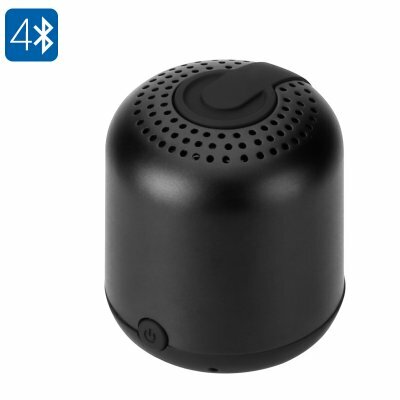 Thanks to its Bluetooth 4.2 support, this mini Bluetooth speaker supports great wireless connectivity. Simply synchronize it with your smartphone, and you’ll be able to enjoy your songs without experiencing any lag. Although small in size, this mini speaker is capable of producing quite a punch. By supporting up to 80dB, you’ll be able to crank up the volume and fully enjoy your music to its most. Its 5W speaker produces high-quality audio. Thanks to this, you’ll be able to listen to those all time favorites in audiophile-grade quality no matter where you are. From now on, you and your friends will always be able to enjoy your songs. A small but powerful 400mAh battery provides you with plenty of power. This allows you to get through the day without needing to worry about running out of juice. Wherever you’ll be heading next, you’ll always be able to enjoy your music on the go. This mini Bluetooth speaker comes with a 12 months warranty, brought to you by the leader in electronic devices as well as wholesale electronic gadgets..